Many cities engage directly with their utilities to improve the delivery of energy efficiency programs to their residents and businesses and to support their sustainability initiatives. This contact can benefit both cities and utilities. Cities gain additional resources to help meet their energy goals, while utilities achieve greater customer satisfaction and higher program participation and energy savings to further their policy objectives. This web page is one of a series of resources on how local governments and utilities can collaborate to advance energy efficiency. This overview describes the mutual benefits of energy efficiency partnerships to cities and investor-owned utilities. It also includes a typology of engagement strategies. Cities where the electric or gas utility is municipally owned and communities that are served by a utility cooperative are often exempt from state regulation or subject to different state policies than investor-owned utilities. In these cases cities can more directly influence utility energy efficiency policy and programs. However this series of resources focuses on cities served by investor-owned utilities, where opportunities for local governments to influence utility energy efficiency policy and programs are less clear. Some of the partnership types we identify are also relevant to municipally and cooperatively owned utilities, even though their governance and incentive structures differ. Many local governments realize the benefits of partnering with their energy utilities and are already doing so. Some are leveraging ratepayer-funded energy efficiency programs and other utility efficiency efforts to expand their own citywide initiatives. The options for these partnerships range from formal funding agreements to informal marketing and outreach promoting energy efficiency programs. In addition to providing financial support for community efforts, utilities can offer access to energy usage data, technical expertise and support for energy management strategies, and support for the development of an energy efficiency workforce. Cities should choose partnership activities with a view to their local institutional context, including state policy support for utility energy efficiency. Utilities also stand to gain from these partnerships, especially those with energy efficiency goals. By leveraging local outreach efforts, utilities can achieve greater program participation and energy savings, reach new sectors, improve customer satisfaction, and gain new community allies. Cities are well suited to help utilities with program outreach and coordination, particularly involving groups they reach through other city services such as municipal utilities (e.g., solid waste, water, and wastewater), public safety, permitting, or programs for small businesses and low-income residents. Even utilities not subject to energy efficiency requirements can improve their relationships with customers by supporting popular local programs and visible efficiency efforts. They can also benefit by expanding energy efficiency activities and avoiding risky capital expenditures such as new infrastructure in urban areas. Local governments in areas served by investor-owned utilities have limited authority over them compared to those that have publicly owned utilities. Public utility regulatory commissions determine the policies that shape the energy efficiency efforts of investor-owned utilities. Some localities can charge franchise fees for using public rights-of-way to distribute electricity and gas to customers. The authority to charge these fees and what municipalities can require of utilities vary by state. Similarly, in several states with deregulated energy markets, municipal aggregation agreements allow local governments to arrange for the bulk purchase of electricity or gas from a third-party supplier. Such bulk purchasing enables the locality to negotiate rates, often lower than current rates, for all customers within the city. Local governments can also use franchise agreements or municipal aggregation to negotiate renewable energy or energy efficiency requirements as responsibilities of the supplier. In the absence of formal regulatory authority, local governments can influence and leverage the investments of investor-owned utilities by demonstrating the value the city can provide and by developing partnerships based on a shared understanding of mutual benefit. The most effective partnership strategies will depend on political will, the policy levers available to the local government, the level of utility ratepayer funding available for energy efficiency, and the strength of existing efficiency programs. The strategy areas and tactics for partnership can be organized into a typology based on their suitability given different levels of existing state and utility support for energy efficiency. Our typology identifies three levels of support: limited, supportive but ramping up, and robust. Table 1 outlines tactics for each strategy based on these levels. The tactics should be thought of as options that can build on one another. 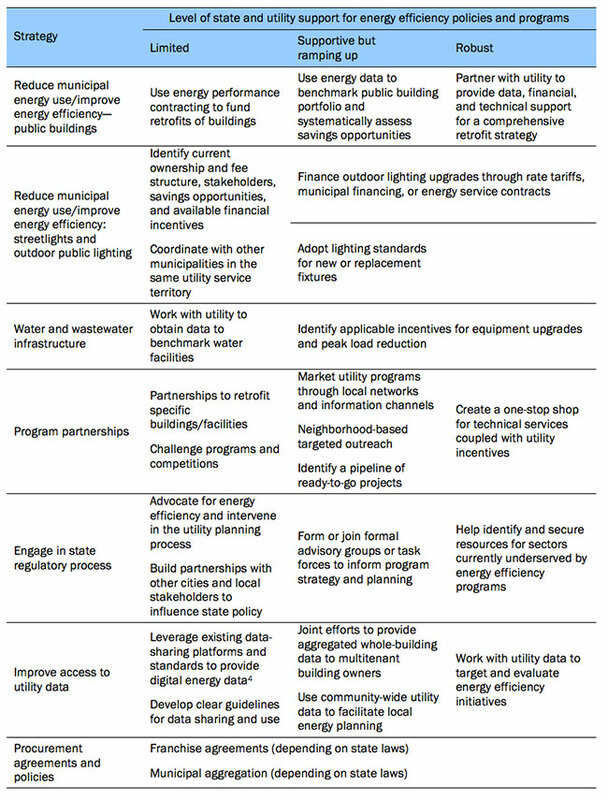 The ones in the first two columns will still be effective even in states with robust energy efficiency initiatives, but certain strategies will be most effective when strong, utility-led efficiency programs can be leveraged. While other methods of organizing these partnership opportunities are possible and could be valuable, this typology overlays areas of opportunity or interest with institutional factors that can enable or limit success. Limited policy and programs describe states where there is limited state policy encouraging or requiring utilities to invest in energy efficiency, and few if any state-mandated utility ratepayer-funded energy efficiency programs. In addition to engaging in state regulatory processes and advocating for energy efficiency policies at the state level, local governments in these states can seek utility support for specific projects, especially high-level projects that can improve the utility’s relationships with its customers. Where state policy permits, local governments can also incorporate energy efficiency into the procurement of energy supply through franchise and municipal aggregation agreements. Supportive but ramping up states have a policy framework conducive to utility energy efficiency but are in the process of developing mature programs and utility business models that would strengthen existing efforts. Typically in these states, an energy efficiency resource standard (EERS) has been adopted or efficiency is well incorporated into utility resource planning practices. Even in these states, utilities are still in an early stage of developing and implementing programs and regulatory mechanisms for efficiency. In these states, cities and utilities can work together to design effective programs and then jointly market them to local residents and businesses through local networks and challenge programs. Robust states have policies in place to encourage efficiency investments. They also have established, successful energy efficiency programs that are consistently being evaluated and improved to increase savings and reach new markets. In these states, cities can be valuable partners in identifying new opportunities for energy savings by connecting utility programs with pipelines of projects, creating one-stop shops, and incorporating utility energy usage data into local planning efforts. Additionally, utilities can work with cities to target hard-to-reach sectors, especially those in which other cities have been successful. When developing strategies for your community, start by reviewing current state policies and programs offered by utilities, as well as what plans are in place for the near future. Local governments and utilities should ask themselves a few key questions in order to identify opportunities and determine the most appropriate strategies. Does your government have direct staff-to-staff relationships with your energy efficiency programs? Have you worked together on projects or programs in the past? What level of political will and leadership is there in your community for developing partnerships and initiatives related to energy efficiency? If the leadership is limited, consider starting small, perhaps with local government lead-by-example actions, and getting some easy wins before developing a more extensive partnership. How do utility programs currently match up with your community’s goals and priorities? What are the utility’s goals and what challenges can you help them overcome? Does your utility have direct energy efficiency program staff-to-staff relationships with local governments in your service territory? Have you worked together on efficiency projects or programs in the past? What objectives, resources, or competencies (e.g., energy-related goals, service delivery and communications channels) do local governments in your service territory have that are related to your goals? What barriers are there to developing external partnerships? Are the barriers within the company or are they a result of the regulatory environment? Can they be addressed through changes in regulation (e.g. design of cost-benefit tests for programs, etc.)? Local governments and utilities both benefit when they work together to improve energy efficiency. They should pursue partnership strategies and tactics with an understanding of the local institutional context. In order to foster partnerships and develop appropriate strategies, cities should reach out to their utilities as well as to state utility commissions and policymakers to build relationships and identify opportunities to collaborate. Utilities should be similarly proactive in seeking input from cities as they evaluate their energy efficiency portfolios and develop new programs. Finally, state policymakers at utility commissions as well as state energy offices can help facilitate these partnerships by encouraging cities and utilities to work together in formal or informal task forces and stakeholder groups. Funding arrangements may include franchise agreements, municipal aggregation contracts, or other agreements with a utility. For an overview of local government and utility partnerships, see the Energy and Water Utilities section of the 2015 City Energy Efficiency Scorecard . Investor-owned utilities are private companies with ownership shares held by stockholders and are primarily regulated at the state level by public service commissions. Publicly owned utilities (including rural electric cooperatives, municipal utilities, and federal or state power authorities) are overseen by a variety of organizations such as coop boards, municipal governments, or federal regulators, and are not generally regulated by state commissions. For more information on investor-owned and publicly owned utilities, see http://aceee.org/topics/utility-regulation-and-policy . Public utility regulatory commissions are often guided by policies established by state legislatures or governors. These commissions can often set energy savings targets for investor-owned utilities and approve detailed energy efficiency program plans and budgets to achieve them. Existing data platforms include DOE’s Green Button initiative, which provides utility customers with easy and secure access to their energy usage information, and EPA’s Automated Benchmarking Services, which provides a framework for exchanging data between EPA’s energy performance rating system and a third-party energy service provider’s system. An energy efficiency resource standard establishes specific, long-term targets for energy savings that utilities or non-utility program administrators must meet through customer energy efficiency programs. For more information on EERSs, see http://aceee.org/topics/energy-efficiency-resource-standard-eers . Partnering with Utilities and Other Ratepayer-Funded Energy Efficiency Program Administrators , provides an overview of the drivers of utility investments in energy efficiency, the common types of utility ratepayer-funded energy efficiency programs, and the policy drivers. The “Energy and Water Utilities” section of ACEEE’s City Energy Efficiency Scorecard  and related Local Policy Database  include many examples of local-utility partnerships. List of Legislation and Campaigns Leveraging ENERGY STAR ®, a resource provided by DOE and EPA, describes a variety of local government initiatives and policies using the ENERGY STAR suite of tools.